Just thought i'd share my setup for fast map testing and some other tweaks. 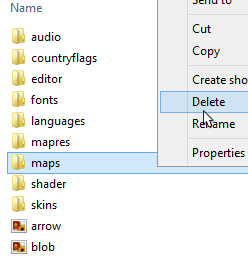 # Map to start server with sv_map "Kobra 4"
# Map to start server with sv_map "LiveTest"
1.Delete existing 'maps' folder from the data folder. 2.Go to your %appdata% > teeworlds folder and send the maps folder to desktop as a shortcut. 3.Rename it from 'maps - Shortcut' to 'maps' and put that bad boi into the data folder. Its 2 ahk scripts that will do a bunch of stuff for us. Put both files into your game folder. Note: Make sure that you have a map named 'LiveTest' in the data>maps folder. Ill keep this updated if i come up/someone suggests any useful things. Last edited by ┇»MíM«┇ on Wed Mar 20, 2019 6:43 am, edited 3 times in total. Nice. I guess this is the AHK program? 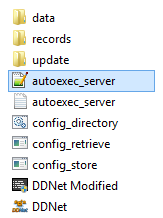 Using "Exe2Ahk.exe" to decompile "DDNet+ Server.exe" gives the error "Open: The following error occurred: NotARC", non of the other results faired better. Nice tutorial, well laid out, easy to follow. i assume the above code(Deens post) is the AutoHotKey 'code', which is good as you rely on an external host, bad practice for tutorials which are meant to be around for a while. i wish DDnet would include some way of making LAN servers to test & play Maps, not so unlike others have. sharing sources is the way to go man, we want people to take idea's & make them better. as long as people can easy get them with this Resource Hacker the same results are achieved. also messy is how you make it look, not the information presented, see my tutorial viewtopic.php?f=16&t=5819 & search for "old version", although your's is better looking then mine, so who i'm i to judge. sorry if i sound like an ignorant fool, we all have to start some where. Last edited by GG Kid on Thu Nov 15, 2018 1:05 am, edited 1 time in total. Not sure what you're talking about p.p and besides, i'd rather have a vote to do that for me instead of everytime i save the map in the editor it reloads the server. I think Exe2Ahk is outdated. You can try using this. I would post every script in here but that would just make this topic messy. Bumping this just so people that use it (although i know there aren't many of them) will get the updated one, first/second version i've posted here had pretty bad functionality, hopefully now its much better.